Presentation with metastatic cervical lymphadenopathy is not uncommon for patients with squamous cell carcinoma of the head and neck. In most cases, a thorough head and neck examination and various imaging modalities determines the primary site (origin) of the cancer. When clinicians are unable to determine the origin of the metastatic cervical lymphadenopathy, the cancer is said to originate from an unknown primary site. See the image below. 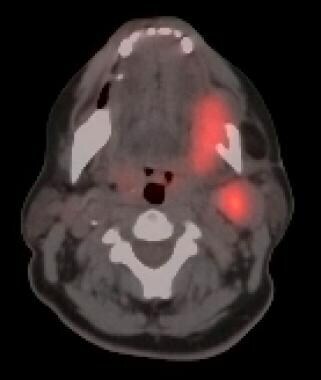 Computed tomography (CT)/positron emission tomography (PET) fusion; areas of uptake on the PET scan are mapped to the CT scan, and this image depicts the primary lesion in the left floor of mouth with metastatic disease to level II. A thorough history is obtained. The history should focus on questions regarding the presence or absence of the symptoms (see Table), and this can help direct the clinician in the search for the unknown primary cancer. Muller von der Grun J, Tahtali A, Ghanaati S, Rodel C, Balermpas P. Diagnostic and treatment modalities for patients with cervical lymph node metastases of unknown primary site - current status and challenges. Radiat Oncol. 2017 May 10. 12 (1):82. [Medline]. [Full Text]. Jereczek-Fossa BA, Jassem J, Orecchia R. Cervical lymph node metastases of squamous cell carcinoma from an unknown primary. Cancer Treat Rev. 2004 Apr. 30(2):153-64. [Medline]. Wenig BM. Neoplasms of the nasal cavity and paranasal sinuses. Wenig BM, ed. Atlas of Head and Neck Pathology. Philadelphia: WB Saunders Co; 1993. 29-39. Mendenhall WM, Mancuso AA, Parsons JT, Stringer SP, Cassisi NJ. Diagnostic evaluation of squamous cell carcinoma metastatic to cervical lymph nodes from an unknown head and neck primary site. Head Neck. 1998 Dec. 20(8):739-44. [Medline]. Termine N, Panzarella V, Falaschini S, et al. HPV in oral squamous cell carcinoma vs head and neck squamous cell carcinoma biopsies: a meta-analysis (1988-2007). Ann Oncol. 2008 Oct. 19(10):1681-90. [Medline]. Davidson BJ, Harter W, OMalley BB. Cervical lymph node metastasis from squamous cell carcinoma with unknown primary site. Harrison LB, Sessions RB, Hong WK, eds. Head and Neck Cancer-Multidisciplinary Approach. NY: Lippincott-Raven; 1999. 391-410. Simo R, OConnell M. Metastatic squamous cell carcinoma of occult primary: beware the tonsillar remnant. J Laryngol Otol. 2008 Jun. 122(6):641-3. [Medline]. Schmalbach CE, Miller FR. Occult primary head and neck carcinoma. Curr Oncol Rep. 2007 Mar. 9(2):139-46. [Medline]. Savoury LW, Glckman JL. Cervical metastasis. Paparella MM, Shumrick DA, Myeroff WL, eds. Otolaryngology. 3rd ed. Philadelphia: WB Saunders Co; 1991. 2565-2568. DeSanto LW, Neel HB 3rd. Squamous cell carcinoma. Metastasis to the neck from an unknown or undiscovered primary. Otolaryngol Clin North Am. 1985 Aug. 18(3):505-13. [Medline]. Neel HB 3rd, Pearson GR, Weiland LH, Taylor WF, Goepfert HH. Immunologic detection of occult primary cancer of the head and neck. Otolaryngol Head Neck Surg. 1981 Mar-Apr. 89(2):230-4. [Medline]. Zhang MQ, El-Mofty SK, Davila RM. Detection of human papillomavirus-related squamous cell carcinoma cytologically and by in situ hybridization in fine-needle aspiration biopsies of cervical metastasis: a tool for identifying the site of an occult head and neck primary. Cancer. 2008 Apr 25. 114(2):118-23. [Medline]. Motz K, Qualliotine JR, Rettig E, Richmon JD, Eisele DW, Fakhry C. Changes in Unknown Primary Squamous Cell Carcinoma of the Head and Neck at Initial Presentation in the Era of Human Papillomavirus. JAMA Otolaryngol Head Neck Surg. 2016 Mar. 142 (3):223-8. [Medline]. Boscolo-Rizzo P, Schroeder L, Romeo S, Pawlita M. The prevalence of human papillomavirus in squamous cell carcinoma of unknown primary site metastatic to neck lymph nodes: a systematic review. Clin Exp Metastasis. 2015 Dec. 32 (8):835-45. [Medline]. Brouwer J, de Bree R, Hoekstra OS, et al. Screening for distant metastases in patients with head and neck cancer: is chest computed tomography sufficient?. Laryngoscope. 2005 Oct. 115(10):1813-7. [Medline]. McCabe KJ, Rubinstein D. Advances in head and neck imaging. Otolaryngol Clin North Am. 2005 Apr. 38(2):307-19, vii. [Medline]. Pepper C, Pai I, Hay A, et al. Investigation strategy in the management of metastatic adenocarcinoma of unknown primary presenting as cervical lymphadenopathy. Acta Otolaryngol. 2014 Aug. 134 (8):838-42. [Medline]. Dillon WP, Harnsberger HR. The impact of radiologic imaging on staging of cancer of the head and neck. Semin Oncol. 1991 Apr. 18(2):64-79. [Medline]. Mani N, George MM, Nash L, Anwar B, Homer JJ. Role of 18-Fludeoxyglucose positron emission tomography-computed tomography and subsequent panendoscopy in head and neck squamous cell carcinoma of unknown primary. Laryngoscope. 2016 Jun. 126 (6):1354-8. [Medline]. Regelink G, Brouwer J, de Bree R. Detectin of unknown primary tumours and distant metastases in patients with cervical metastases: value of FDG-PET versus conventional modalities. European Journal of Nuclear Medicine & Molecular Imaging. 2002. 29:1024-30. Miller FR, Hussey D, Beeram M, Eng T, McGuff HS, Otto RA. Positron emission tomography in the management of unknown primary head and neck carcinoma. Arch Otolaryngol Head Neck Surg. 2005 Jul. 131(7):626-9. [Medline]. Jungehulsing M, Scheidhauer K, Damm M, et al. 2[F]-fluoro-2-deoxy-D-glucose positron emission tomography is a sensitive tool for the detection of occult primary cancer (carcinoma of unknown primary syndrome) with head and neck lymph node manifestation. Otolaryngol Head Neck Surg. 2000 Sep. 123(3):294-301. [Medline]. Greven KM, Keyes JW Jr, Williams DW 3rd, McGuirt WF, Joyce WT 3rd. Occult primary tumors of the head and neck: lack of benefit from positron emission tomography imaging with 2-[F-18]fluoro-2-deoxy-D-glucose. Cancer. 1999 Jul 1. 86(1):114-8. [Medline]. Zanation AM, Sutton DK, Couch ME, Weissler MC, Shockley WW, Shores CG. Use, accuracy, and implications for patient management of [18F]-2-fluorodeoxyglucose-positron emission/computerized tomography for head and neck tumors. Laryngoscope. 2005 Jul. 115(7):1186-90. [Medline]. Jesse RH, Perez CA, Fletcher GH. Cervical lymph node metastasis: unknown primary cancer. Cancer. 1973 Apr. 31(4):854-9. [Medline]. Grau C, Johansen LV, Jakobsen J, Geertsen P, Andersen E, Jensen BB. Cervical lymph node metastases from unknown primary tumours. Results from a national survey by the Danish Society for Head and Neck Oncology. Radiother Oncol. 2000 May. 55(2):121-9. [Medline]. Maulard C, Housset M, Brunel P, et al. Postoperative radiation therapy for cervical lymph node metastases from an occult squamous cell carcinoma. Laryngoscope. 1992 Aug. 102(8):884-90. [Medline]. Argiris A, Smith SM, Stenson K, et al. Concurrent chemoradiotherapy for N2 or N3 squamous cell carcinoma of the head and neck from an occult primary. Ann Oncol. 2003 Aug. 14(8):1306-11. [Medline]. Sher DJ, Balboni TA, Haddad RI, et al. Efficacy and toxicity of chemoradiotherapy using intensity-modulated radiotherapy for unknown primary of head and neck. Int J Radiat Oncol Biol Phys. 2011 Aug 1. 80(5):1405-11. [Medline]. Chen AM, Farwell DG, Lau DH, Li BQ, Luu Q, Donald PJ. Radiation Therapy in the Management of Head-and-Neck Cancer of Unknown Primary Origin: How Does the Addition of Concurrent Chemotherapy Affect the Therapeutic Ratio?. Int J Radiat Oncol Biol Phys. 2011 Oct 1. 81(2):346-52. [Medline]. Randall DA, Johnstone PA, Foss RD, Martin PJ. Tonsillectomy in diagnosis of the unknown primary tumor of the head and neck. Otolaryngol Head Neck Surg. 2000 Jan. 122(1):52-5. [Medline]. Kothari P, Randhawa PS, Farrell R. Role of tonsillectomy in the search for a squamous cell carcinoma from an unknown primary in the head and neck. Br J Oral Maxillofac Surg. 2008 Jun. 46(4):283-7. [Medline]. Dragan AD, Nixon IJ, Guerrero-Urbano MT, Oakley R, Jeannon JP, Simo R. Selective neck dissection as a therapeutic option in management of squamous cell carcinoma of unknown primary. Eur Arch Otorhinolaryngol. 2013 Jul 27. [Medline]. Lou J, Wang S, Wang K, Chen C, Zhao J, Guo L. Squamous cell carcinoma of cervical lymph nodes from an unknown primary site: the impact of neck dissection. J Cancer Res Ther. 2015 Oct. 11 Suppl 2:C161-7. [Medline]. [Full Text]. Patel SA, Magnuson JS, Holsinger FC, Karni RJ, Richmon JD, Gross ND, et al. Robotic Surgery for Primary Head and Neck Squamous Cell Carcinoma of Unknown Site. JAMA Otolaryngol Head Neck Surg. 2013 Oct 17. [Medline]. Geltzeiler M, Doerfler S, Turner M, et al. Transoral robotic surgery for management of cervical unknown primary squamous cell carcinoma: updates on efficacy, surgical technique and margin status. Oral Oncol. 2017 Mar. 66:9-13. [Medline]. Fu TS, Foreman A, Goldstein DP, de Almeida JR. The role of transoral robotic surgery, transoral laser microsurgery, and lingual tonsillectomy in the identification of head and neck squamous cell carcinoma of unknown primary origin: a systematic review. J Otolaryngol Head Neck Surg. 2016 May 4. 45 (1):28. [Medline]. [Full Text]. Huang CC, Tseng FY, Yeh TH, et al. Prognostic factors of unknown primary head and neck squamous cell carcinoma. Otolaryngol Head Neck Surg. 2008 Sep. 139(3):429-35. [Medline]. Mackenzie K, Watson M, Jankowska P, Bhide S, Simo R. Investigation and management of the unknown primary with metastatic neck disease: United Kingdom National Multidisciplinary Guidelines. J Laryngol Otol. 2016 May. 130 (S2):S170-5. [Medline]. [Full Text]. Computed tomography (CT) scan of neck with contrast. The arrows indicate metastatic lymphadenopathy. Image courtesy of Head and Neck Cancer-Multidisciplinary Approach, Davidson, BJ. Histologic appearance of metastatic squamous cell carcinoma. Image courtesy of Atlas of Head and Neck Pathology, Wenig, BM.